A South Carolina girl who has not been able to attend school in nearly two years now gets to go to class via a robotic version of herself using VGo. Lexie Kinder goes to school from home because of a cardiac pulmonary illness, but wants more than anything to be a normal student. Using VGo, a remote student can see, hear, talk, interact and move around as if they were in the school. 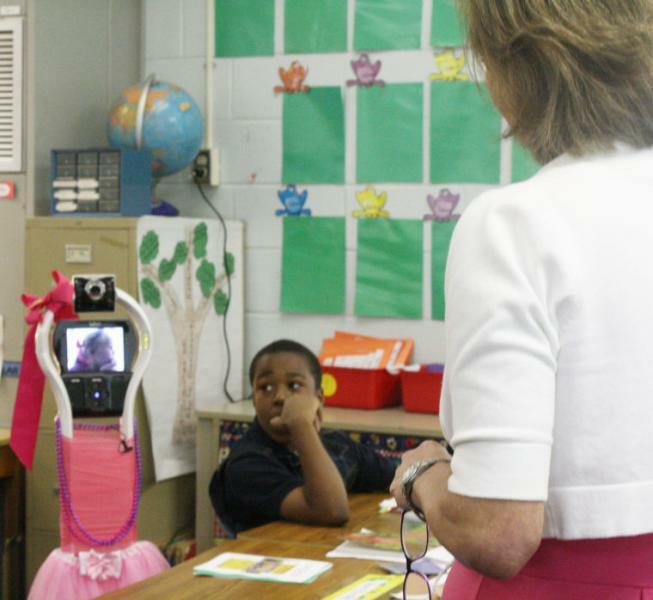 Sumter School District is the first school district in the state to pilot VGo, a machine that allows a student to attend school and interact with others through a camera and audio. The district ordered three robots a month ago, but it takes time to set up the infrastructure and networks, he said. Lexie also had to learn to operate it. 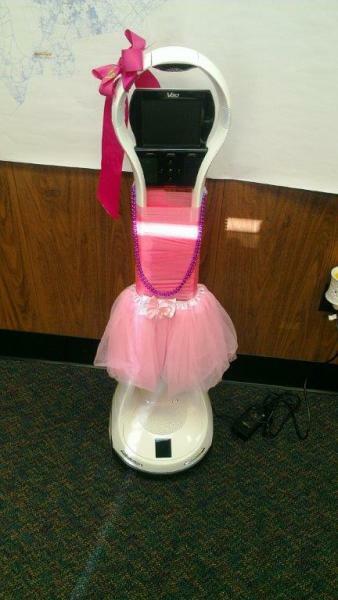 So she started attending Alice Drive Elementary via 'Princess VGo' just last week. The VGos cost about $6,000 apiece and were bought using a set of funds marked specifically for health-based concerns, Hagerty said. The cost is about the same as traditional homebound instructions, but the experience the students will get is priceless, though, he said. Her teacher, Ivey Smith, said it has been an adjustment having a robot in class but nothing that couldn’t be handled. Lexie dials into the robot at 7:45 a.m. and drives it to her desk. She turns the robot so she can say the pledge of allegiance and the state pledge. Then she joins in the lessons. The students agree. They yell “Lexie’s coming” when the screen on the VGo lights up. They wave at it and greet her as she moves the robot to her desk. The other student who sits near the robot, Tymirh Beyfoster, agreed. Cindy Roberson, an assistive technology specialist with the district who helps students overcome barriers to their education, has observed the children helping. The children are very empathetic with their classmates. The VGo’s “head” lights up when Lexie has a question, but it doesn’t make a noise to distrub the class. “So the students raise their hands, and when they are chosen they say, ‘Lexie has a question,’ ” she said. Principal Sheree Boozer also prepped her staff before the robot made its appearance. Watch the Fox Video for the full story. Kinder is one of 30 students with special needs in 13 states using VGo. It has been on the market for a little over two years and is sold by VGo Communications. “Its an awesome, awesome opportunity for children,” said Kinder’s mom, Christi Kinder.